Designed for uninterrupted hair removal in dry conditions, the Silk-épil 5 Power epilator will never let you down. 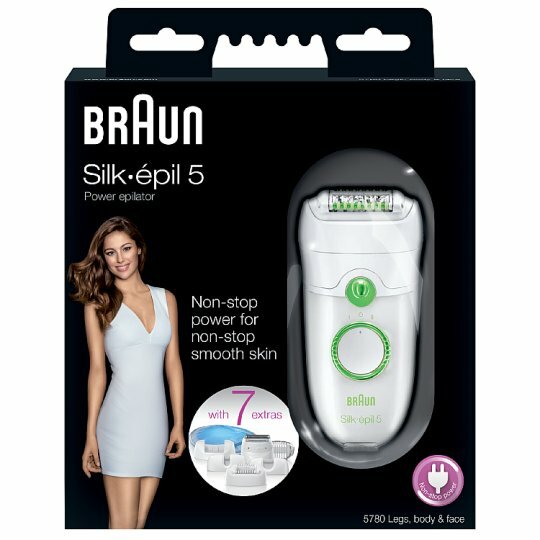 Braun's specially designed Close-Grip 40 Tweezer epilation technology catches hair as small as a grain of sand (0.5mm), so you'll never have to wait for your body hair to grow so wax can catch it. No more in-between days, no more hassle. 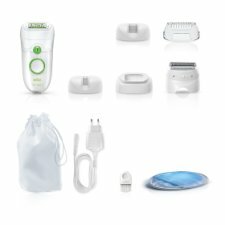 A shaver head and trimmer cap are included to convert your epilator into a full-fledged electric shaver for depilation. For hygienic reasons, do not share this appliance with other persons. This appliance is provided with a special cord set with an integrated Safety Extra Low Voltage power supply. Do not exchange or manipulate any part of it. Otherwise there is risk of electric shock. This appliance can be used by children aged from 8 years above and persons with reduced physical, sensory or mental capabilities or lack or experience and knowledge if they have been given supervision or instruction concerning the safe use of the appliance and understand the hazards involved. Children should not play with the appliance. Cleaning and user maintenance should not be made by children unless they are older than 8 years and supervised. When switched on, the appliance must never come in contact with the hair on your head, eyelashes, ribbons, etc. to prevent any danger of injury as well as to prevent blockage or damage to the appliance. Never use the epilation head without a cap.